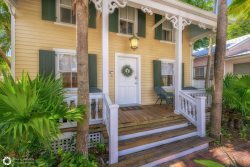 Sitting on the infamous Duval Street, this spacious one bedroom property is so relaxing and beautiful that you will never want to leave! The breezy private balcony is a great place to sit and soak up the rising sun as Duval Street buzzes with morning activity. The loft bedroom upstairs features two comfortable queen beds, a 32" flat-screen TV, two large closets, and a shared nightstand with a reading lamp. The sizable living room is adorned with Cuban art in remembrance that the property was built in 1917 as a “club” for Cuban cigar makers. The queen sleeper sofa comfortably accommodates two people, so that La Casa Cubana can sleep 6 people while still remaining competitively priced. The kitchen features a full-sized refrigerator, oven, dishwasher, toaster, microwave, and coffee maker to do all or none of the cooking while enjoying the island life. You’ll want to take pictures at the Southernmost Point in the continental United States (only 3.5 blocks away), and fulfill all of your shopping desires at the dozens, if not hundreds, of shops and stores distributed along Duval and adjoining streets. One block away is Banana Cafe, a fantastic French restaurant for breakfast with crepes, baguettes, and croissants. The sandy shores of South Beach are just 3 blocks away, with the Southernmost Cafe right there for lunch. The best sushi in town is served at Origami, also located one block away. It’s all there for you, so come and enjoy!